Yes, "Bjorn" has a little bit of an international flair about it, doesn't it? Well, that's cause he's Norwegian. Guess what? So is the Handyman. Half-Norwegian. Half-Iowan. Half-crazy most days, but I can explain all those half's later. Every year since I've been smooching the Handyman, Bjorn comes over for several weeks - sometimes twice a year - for vacation. We're talking just about two years smooching that Handyman, and if I'm correct, this is the Norwegian's, aka Bjorn's, fourth visit. There's a nickname waiting to happen regarding Bjorn's spending habits on guitars, golf clubs, and fly-fishing equipment, but I've encouraged the handyman to resist because at least the Norwegian's not buying guns. No mocking of mentioned shopped items shall occur while he's not purchasing guns and tasers and handcuffs, etc. 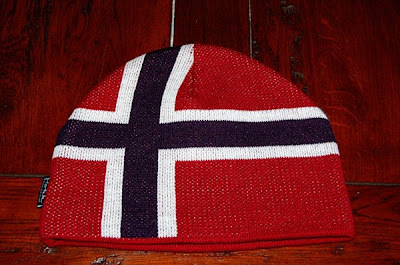 Yes, the Norwegian is big into all of those things, too. It's called Personal Protection, and if you need it, the Norwegian is your man. (Are you seeing the depths of humor that particular Halloween costume conjurs?). Bjorn is qualified in all kinds of martial arts, and besides being a security guard, he has completed several personal protection workshops held by the Black Hats or Furry Cats or Nine Lives or something... I've forgotten. Those workshops were referred to, by the Handyman and myself, as his opportunity to go learn how to "shoot guns, crash cars, and beat people up." It should be said that the Norwegian already knows how to shoot guns after being on the national shooting team. Pretty cool... I think there are laws against guns in Norway, but being on the national shooting team has afforded Bjorn a few opportunities to indulge his passion for fire arms. Where is this all going, you might ask? And he brought me a GIFT! The handyman got one on the last visit, and, boy, did I covet that tuke. I'm a happy gal. I'm not Norwegian... But I know a good, thick, comfy tuke when I see one. And the Norwegian flag is pretty cool. Ha de bra.... Or something like that. Hadet bra means goodbye, so you're right about that one. Hei = hello. God dag = good day. God natt = good night.